Someday not too far in the future, the idea of having to catch the attention of a bartender or preparing your own drinks at home may be a thing of the past. In celebration of Cinco de Mayo, we’ve compiled a list of of five Arduino robotic mixologists that’ll help whip you up a margarita or daiquiri with just the press of a button. 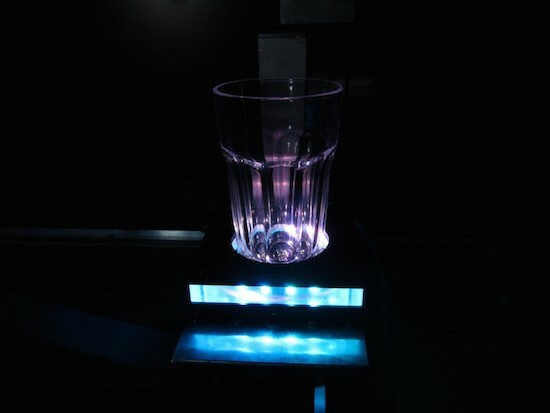 The RumBot is equipped with a set of five reflective optical sensors, each represented by a different drink. Whenever a cup is placed on one of these sensors, the machine is triggered and a pre-programmed recipe begins dispensing the beverage of choice into your mug in as little as three seconds. 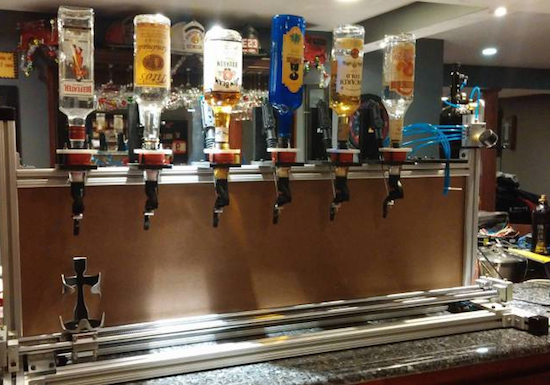 Drink selection is handled by an Arduino Uno, which communicates with an all-in-one servo motor. This moves the nozzle into place, and then controls the on-time of five pumps to begin pouring the cocktail. 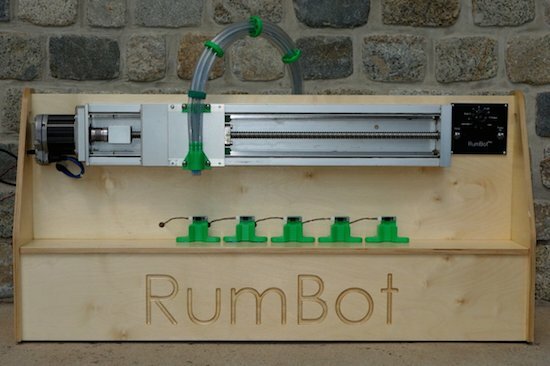 RumBot’s frame is comprised of wood and several 3D-printed plastic parts, while a strength knob also lets you configure the amount of alcohol content. 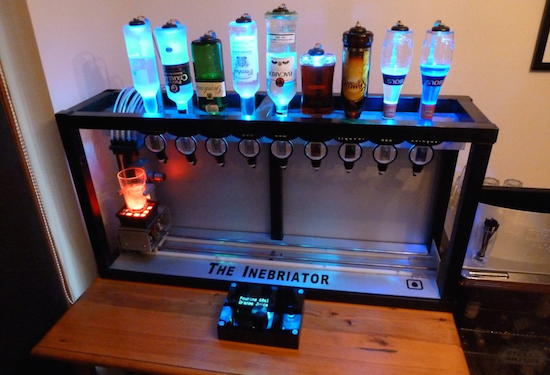 The Inebriator‘s design is fairly simply, with upside-down bottles lined up in a row and optics providing set measures. The user places their glass on a pedestal and selects their drink of choice on its accompanying display. The pedestal then moves along collecting the right spirits as it goes thanks to motors pushing the glass upwards at the appropriate moments. Finally it adds the mixers, connected as and when needed by nitrogen-pressurized tubes to deliver the final touches to the cocktails from a cooler located out of sight. The bot is driven by an Arduino Mega and includes a total of 132 LEDs that change colors each time a new ingredient is added. 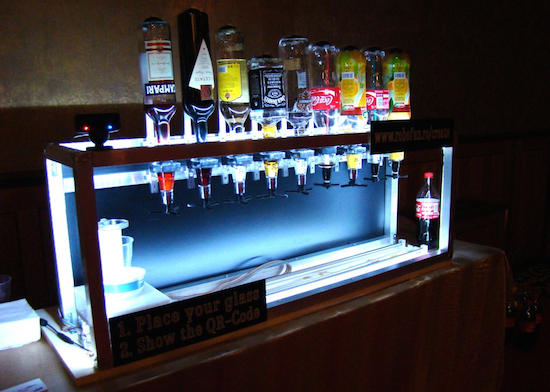 For some extra effects, the drink tray is surrounded by an Arduino Nano-powered LED ring. Unlike some other robotic bartenders, the Social Drink Machine uses a Facebook app and Twitter bot to prepare your drink. To get going, you first scan the QR code displayed alongside the device with their mobile phone or sends a tweet to @socialdrinkbot. This will pull up an app, which allows you to select which type of concoction you’d like. You’ll then receive another QR code on your phone that must be shown to the machine’s camera. Set your glass on its holding tray, and the Arduino-powered bot will take care of the rest. Data Cocktail is an innovative gadget that whips up cocktails based on Twitter activity. 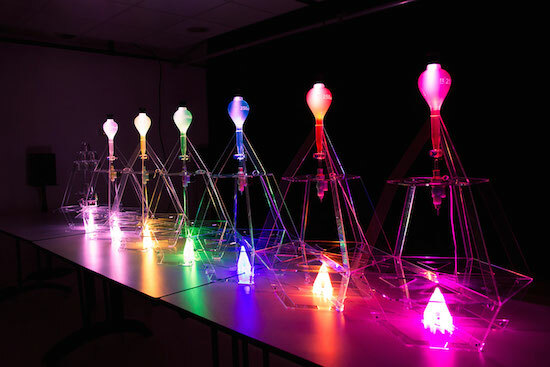 The bot, which runs on Arduino Due and Arduino Pro Mini, works by scouring the web for the five latest posts mentioning keywords that are linked to available ingredients, each represented by differently colored bulbs. (The system will accept either words, hashtags and mentions.) These messages are then used to define the composition of the drink and fill the glass accordingly. The result is an original, crowdsourced mixture whose recipe can be printed out. Drinkmo is an automated device that works by rotating a long leadscrew to moves the mixing glass from bottle to bottle. The entire setup is comprised of aluminum extrusion, making it completely expandable. Along the top are gravity fed shot dispensers, which are controlled by 12VDC car lock actuators. The chaser station works differently, though. The chaser bottles are actually pressurized by a paintball gun tank and dispensed using four solenoid valves. Then one valve is actuated, it opens, allowing the pressure to push fluid through the solenoid. The entire system is based on a Raspberry Pi running Raspbian, Tkinter for the GUI and an Arduino Uno for motor control. 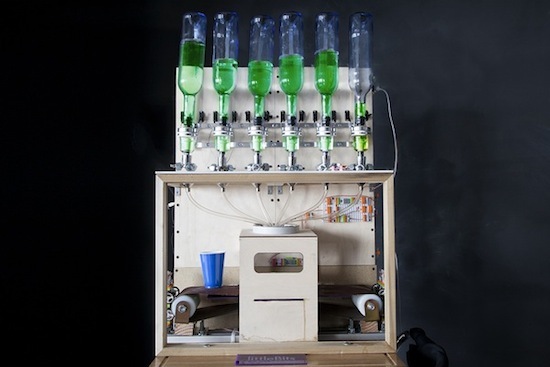 The drinkerBot is a robotic mixer that serves made-to-order drinks for your party guests. It works with a companion web app that enables you to specify whether you want a specialty cocktail, a DIY concoction or a surprise mixture. Once you’ve chosen, the app tells the littleBits cloudBit what to make. The cloudBit’s signal is then passed through a littleBits Arduino module and some logic modules to determine which liquid dispensing mechanisms to activate. The drinkerBot even has a conveyor belt for your cup to travel on during its journey from empty to delicious!